Probably gunk in the injector. You can remove the injector by unscrewing from the top. It's difficult and you need a flexible screwdriver with the correct bit. 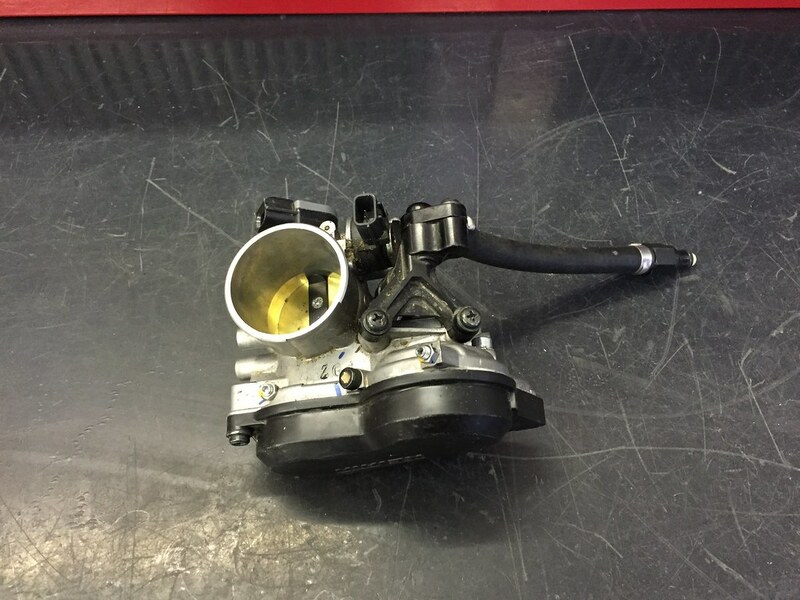 If you cant or give up you have to unfasten the throttle body and take it out on the right side. Hi, i learnt from fellows here in germany to be very carefull which rubber hose you are using in the tank to avoid cloging the filter after some years. there are hoses availble suitable for in/under fuel operation, they are different from the normal fuel hoses you are using outside. dont know why. also learnt that the piaggio vespa 300 and ducati using the same fuel pumps. so maybe a worthwhile check at your local dealer. Whatever way you do it dont use the two phillips screws when you install the injector! Are the screws Phillips or Pozi? Thanks Carsten, I have pretty much came to the same conclusion.. unfortunately I wish I had known this a few years ago! Thanks ended up buying a new impact driver, and got the little rascal out, assuming there is no filter inside??.. I guess its just a replacement job? best place to buy a replacement injector? Its a Keihin and marked K WF04 .. tried googling that partnumber but nothing found. Husaberg, KTM and possibly Husqvarna. List of all the bikes this injector fits.